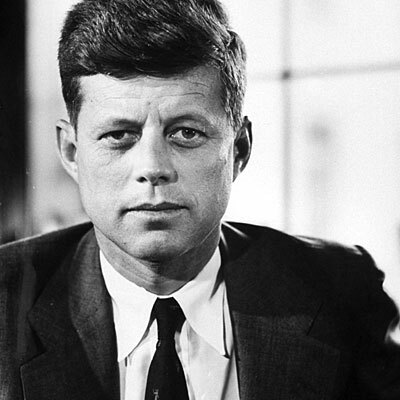 November 22, 1963: President John F. Kennedy was assassinated. April 4, 1968: Martin Luther King Jr. was assassinated. June 6, 1968: Robert F. Kennedy was assassinated. July 21, 1969: Neil Armstrong walks on the moon. You tell me that I need to forget these events as though they never happened? You tell me that you don't care because you weren't born yet? The demographics of Camelot: As you will no doubt have heard by now, today is the 50th anniversary of the Kennedy assassination. I've also been repeatedly informed that everyone is still shocked and saddened by it, and that "we" will never forget how we felt when we heard the news. Dear newscasters: Most Americans were either not alive yet, or too young to notice. Only 25% of Americans are over 55 (http://www.indexmundi.com/united_states/demographics_profile.html), and some of them were living in other countries in 1963. To most of us, the shooting in Dallas was about like what happened in Ford's Theater, with the exception that our teachers seemed to feel *really* strongly about it. Let it go. Just for the record, I understand how my parents felt on May 5, 1945 (VE Day) even though I wasn't born yet. I understand how they felt when Hiroshima and Nagasaki were destroyed by atomic bombs. I think I know how they felt on March 29, 1945 when President Roosevelt died. I understand what my parents and my grandparents went through on October 29, 1929 when the stock market crashed and life's saving were lost. I listened when they told me of the pain and suffering during the great depression. I never told them to "let it go." 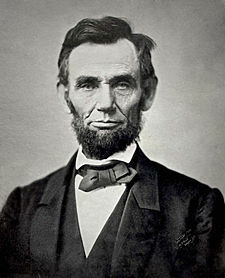 I'd like to think I know how traumatic it must have been for Americans on April 15, 1865 even though I wasn't there. The world did not begin when you were born. Listen and learn from your elders. You will be a better person. It was about 3pm and I was sitting in my geometry class at Nepean High School in Ottawa, Canada. This was my final year of high school. I liked this course and I liked my teacher (Mr. Pollack). The loudspeaker crackled and I heard the Principle's voice. Mr. Callan said that President Kennedy had been shot and killed in Dallas. Kennedy was not my President but it was still a great shock. It seemed like Camelot had been destroyed.1 I spent the next three days in front of the television set. Nobody knew what was going to happen to America. You know how everyone says they know exactly where they were and what they were doing when major events happen? That's certainly true for me on the day John F. Kennedy was assassinated. It's one of only two days in my life that I remember so vividly.2 If it was traumatic for a young Canadian boy, I can't imagine what it must have felt like for Americans. How many of you remember Nov. 22, 1963? It looks very naive now but back in 1963 we really believed that Camelot and King Arthur could be real. Here's Richard Burton in the Broadway production. It seems like everybody had the album. 1. The musical, Camelot had been playing on Broadway since 1960 and everyone was familiar with the music from the LP (record album). 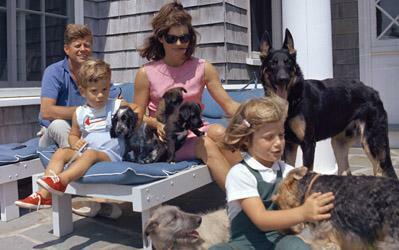 The Kennedy family and the Kennedy administration were intimately associated with the idea of Camelot. 2. The other was Sept. 11, 2001. What Could Possibly Be Wrong with Putting a Cute Dog on the Cover of Science? Nothing could be wrong until you realize that Science writer editor Elizabeth ("Liz") Pennisi is behind it. That changes things entirely. To find out why you have to read Dan Graur's latest at: A Dog on the Cover of @ScienceMagazine: Sins of Omissions. At some point, the big bosses at Science magazine are going to have to wake up to the fact that they're publishing a lot of bad papers and commentaries. Something is seriously wrong. As we frequently hasten to emphasize about daring writers and researchers in science, I have no reason to think Pennisi is a Darwin skeptic much less a proponent of ID. Still, she's a reporter who is open to promoting "evolution heresy." She's unafraid to challenge the old guard. More than once she has stuck her finger in the eye of ancient régime. Now you know why she ticks off guys like Graur and Moran. Yep. He got that right. Graur and I are definitely part of the old regime and we don't like people who promote evolution heresy ... or their sycophants. In a recent article entitled On the immortality of television sets: "function" in the human genome according to the evolution-free gospel of ENCODE, Graur et al. dismantle ENCODEs evidence and conclusion that 80% of the human genome is functional. However, the article by Graur et al. contains assumptions and statements that are questionable. Primarily, the authors limit their evaluation of DNAs biological functions to informational roles, sidestepping putative non-informational functions. Here, I bring forward an old hypothesis on the evolution of genome size and on the role of so called junk DNA (jDNA), which might explain C-value enigma. According to this hypothesis, the jDNA functions as a defense mechanism against insertion mutagenesis by endogenous and exogenous inserting elements such as retroviruses, thereby protecting informational DNA sequences from inactivation or alteration of their expression. Notably, this model couples the mechanisms and the selective forces responsible for the origin of jDNA with its putative protective biological function, which represents a classic case of fighting fire with fire. One of the key tenets of this theory is that in humans and many other species, jDNAs serves as a protective mechanism against insertional oncogenic transformation. As an adaptive defense mechanism, the amount of protective DNA varies from one species to another based on the rate of its origin, insertional mutagenesis activity, and evolutionary constraints on genome size. It's not a good idea to attack someone who; (a) is an expert in the field, (b) is intelligent and outspoken, and (c) has a blog. But that never stopped Claudiu Bandea before so why should it now? Here's part of how Dan Graur responds at: A Pre-Refuted Hypothesis on the Subject of “Junk DNA”. There's more, read it all. The first problem with this hypothesis is that big eukaryotic genomes consist mostly of very few active transposable elements and numerous dead transposable elements. So, big genomes seem to need little protection. Moreover, a positive correlation exists between genome size and number of transposable elements. In 2002, Margaret Kidwell published a paper entitled “Transposable elements and the evolution of genome size in eukaryotes.” In it, she showed that an approximately linear relationship exists between total transposable element DNA and genome size. Copy numbers per family of transposable elements were found to be low and globally constrained in small genomes, but to vary widely in large genomes. Thus, the major characteristic of large genomes is the absence of selective constraint on transposable element copy number. Given that the vast majority of transposable elements are dead, the most parsimonious explanation is that the continuous accumulation of dead transposable elements is the reason for genomes becoming large. Let me spell it out: the “large” part in “large genomes” is made of transposable elements. Genome do not become large first and then protect genetic information by becoming sinks of transposable elements. The other problem with the protection-from-mutation hypothesis is that it assumes selection on mutation to be effective. Selection on mutation is referred to in population genetics as second-order selection. The reason is that this type of selection is anticipatory. It protects against a possibility, not an actuality. Second-order selection on mutation (mutability) requires huge effective population sizes, so huge in fact that they are only found in a few bacteria and viruses. Unfortunately for the protection-from-mutation hypothesis, genome size is known to be inversely correlated with effective population size. In other words, huge genomes are found in species that have very small effective population sizes. So small, in fact, that even regular selection (first-order selection) is not very effective. Thomas Huxley was proven right again: "The great tragedy of Science is the slaying of a beautiful hypothesis by an ugly fact." Several ugly facts in this case. I can't count the number of people who have tried to explain to Claudiu Bandea that his idea is ridiculous. Hopefully, this last embarrassment will silence him. Naturally, the Intelligent Design Creationists are all over it [Another response to Darwin’s followers’ attack on the “not-much-junk-DNA” ENCODE findings]. Which Way Did Darwin Walk? For some reason the title reminds me of "What Does the Fox Say." Oh well, PZ Myers is desperately interested in knowing which way Darwin walked when he took a stroll on the Sandwalk [An important historical question!]. I know which way PZ walked 'cause I led him! I first became aware of Syvlia Brown when I saw her on Larry King Live ten years ago [Interview with Sylvia Browne]. As most of you know, Larry King is a real sucker for quacks of all types and he used to let psychics like Sylvia Browne respond to listeners who called in to the show. It was always good for a laugh. In the middle of that part of the show we have this exchange. KING: OK. Do you know when you're going to die? BROWNE: Yes. When I'm 88. 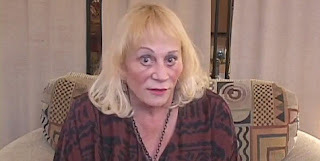 Later on I was happy to post a link to Anderson Cooper's debunking of Sylvia Browne on CNN [Psychic Sylvia Browne Is Nothing but a Con Artist and a Fake]. Sylvia Browne died yesterday [Psychic Sylvia Browne, famous for TV appearances, dies at 77]. She was 77 years old. Only off by 11 years. Is Baker's Yeast a Good Model for the Evolution of Multicellularity? R. Ford Denison has an excellent blog called This Week in Evolution. He recently posted an article about the evolution of multicellularity [Evolving-multicellularity lab exercises]. That post contains a link to a paper he recently published with a former student (Ratcliff et al., 2013). Here's the abstract. Multicellularity was one of the most significant innovations in the history of life, but its initial evolution remains poorly understood. Using experimental evolution, we show that key steps in this transition could have occurred quickly. We subjected the unicellular yeast Saccharomyces cerevisiae to an environment in which we expected multicellularity to be adaptive. We observed the rapid evolution of clustering genotypes that display a novel multicellular life history characterized by reproduction via multicellular propagules, a juvenile phase, and determinate growth. The multicellular clusters are uniclonal, minimizing within-cluster genetic conflicts of interest. Simple among-cell division of labor rapidly evolved. Early multicellular strains were composed of physiologically similar cells, but these subsequently evolved higher rates of programmed cell death (apoptosis), an adaptation that increases propagule production. These results show that key aspects of multicellular complexity, a subject of central importance to biology, can readily evolve from unicellular eukaryotes. Here's the problem. Most fungi are multicellular and Saccharomyces cerevisiae (budding yeast) almost certainly evolved from an ancestor that could form hyphae. In fact, wild-type diploid strains or Saccharomyces cerevisiae will form multicellular filaments (pseudohypha) in response to starvation for nitrogen (Liu et al., 1996). Many of the common lab strains have lost the ability to form multicellular pseudohyphae because they carry a nonsense mutation in the FLO8 gene (Liu et al., 1996). Presumably, those strains have been selected by bakers and brewers over the past several thousand years. Although known transitions to complex multicellularity, with clearly differentiated cell types, occurred over millions of years, we have shown that the first crucial steps in the transition from unicellularity to multicellularity can evolve remarkably quickly under appropriate selective conditions. I don't this this is quite fair since the yeast strain is just reverting to a primitive condition. This might only have required one or a few mutations. It's not a very good model for de novo evolution of multicellarity. The work from Gerry Fink's lab (e.g. Liu et al. 1996) is a good example of why we should be cautious using yeast as a model for anything. The yeast strains used in the lab have been selected for specific characteristics since bread-making and beer-making were first invented over 4000 years ago. We need to be cautious about drawing general conclusions based on work with lab yeast strains. The lab exercise based on the Ratcliff et al. (2012) paper [Experimental Evolution of Multicellularity] may be interesting but it's also misleading. The description of that experiment implies that students are reproducing the ancient evolution of multicellularity from single-cell organisms. Instead, what students are actually looking at is the reversion of a derived, exclusively single-cell strain, to the more primitive multicellular state. That's not the same thing. [Photo Credit: That's Ford at a rally in Ottawa where we were protesting the Conservative government's clamp-down on science in Canada. He took advantage of the audience to advertise his book. Textbook Publishers Respond to Texas School Board: "Up yours!" 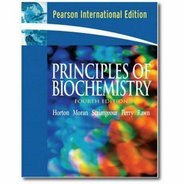 There are a lot of myths surrounding the influence of the Texas Board of Education on the content of biology textbooks. Most people seem to think that major publishers have watered down or eliminated evolution in response to pressure from the Texas board. There's very little evidence to support that claim. In any case, the situation has changed as reported by Josh Rosenau on the NCSE website [What’s the Future of Texas Textbook Battles?]. So far, the publishers are standing strong. Creationists pushed them to water down evolution coverage, but they seem to be finding ways around the reviewers’ suggestions. As Ron Wetherington (who won a Friend of Darwin Award from NCSE in honor of his work on the 2009 standards) told the Dallas Observer "I reviewed the publisher’s response to this. In this particular case, the publisher said, ‘Up yours, we’re not going to change anything.’" We don’t yet know whether the state education agency will accept that response and recommend these textbooks for adoption. Here's the view from TFN Insider [Important News: Publishers Are Resisting Pressure to Dumb Down Their Biology Textbooks for Texas]. All 14 publishers are refusing to water down or compromise instruction on evolution and climate change in their proposed new high school biology textbooks. These publishers deserve our thanks for standing up to pressure from right-wing politicians and activists working to corrupt the science in our children’s textbooks. Contrast this with the question asked by Paul Waldman a few months ago [The Missing Piece in Coverage of Texas Evolution Controversies]. So here's the missing piece: what about the textbook companies? When this issue is discussed, the publishers are talked about as if they have no agency, no ability to affect the outcome of these events. But they're morally culpable for participating in these farces. If they wanted, they could stand up to the state of Texas. So how can the people who work at a publisher in good conscience agree to write a biology textbook that treats evolution as a wild, unsupported idea? What if the Texas Board of Education demanded that their books discuss the "controversy" about whether the Earth travels around the sun or vice-versa, or the "controversy" about whether earthquakes happen because the turtle on whose back the world sits is scratching an itch, or the "controversy" about whether stars are actually faeries winking at us from up in the sky? Would the publishers say, "OK, if that's what you want, we'll write it and print it"? Someone should ask them where they draw the line on their integrity. This was gleefully cross-posted to Jerry Coyne's blog website [Textbooks and Texas] where his sycophants jumped all over me for suggesting that publishers were not actually modifying their textbooks in any significant way. Here's an excerpt from Jerry Coyne's latest post [Creationism on life support at the Texas Board of Education]. This week the Texas Board of Education will consider which biology texts to “recommend” for Texas public-school students. I say “recommend” rather than “adopt” because the rules have changed. The list of approved books, from which all school districts were once required to choose, is now gone, and the Board can only recommend books. Texas school districts can now choose whichever books they want to use, including material from the Internet. That’s a huge bonus to publishers, who used to have to rewrite many of their biology and history books so they’d be acceptable to Texas, largely purging them of evolution and giving a more conservative point of view on American history. Now they won’t have to do that, and publishers are beginning to resist such changes anyway. If all the publishers resisted, Texas wouldn’t have any books to buy! I still think it's misleading to say that publishers "used to have to rewrite many of their biology ... books so they’d be acceptable to Texas, largely purging them of evolution." I've got copies of Miller & Levine's biology textbooks, for example, and they cover evolution quite well. I could be wrong but I don't think the Texas Board of Education ever rejected a biology textbook. They were all on the list of "approved" textbooks even though they covered evolution. From Tressie McMillan Cottom at tressiemc [The Audacity: Thrun Learns A Lesson and Students Pay]. Sebastian Thrun, founder of Udacity, one of the most high-profile private sector attempts to "disrupt" higher education discovered inequality this week. Thrun has spent the last three years dangling the shiny bauble of his elite academic pedigree and messianic vision of the future of higher education before investors and politicos. He promised nothing short of radically transforming higher education for the future by delivering taped classroom lessons of elite professors through massive open online courses. So what went wrong? After low performance rates, low student satisfaction and faculty revolt, Thrun announced this week that he has given up on MOOCs as a vision for higher education disruption. The "godfather of free online education" says that the racially, economically diverse students at SJSU [San Jose State University], "were students from difficult neighborhoods, without good access to computers, and with all kinds of challenges in their lives…[for them] this medium is not a good fit." It seems disruption is hard when poor people insist on existing. Thrun's goal was to market lectures by "elite" professors at places like Sanford1. His new company, Udacity, was going to make tons of money by selling lists of successful students to private companies who are looking for talent. Guess what? It turns out that there are lots of disadvantaged students in introductory courses at SJSU who don't learn from lectures given by elite Stanford professors. Who would have guessed? In case you've forgotten the hype that Sebastian Thrun created when he formed Udacity, read: Sebastian Thrun Will Change Education. And watch the video. 1. My position on this is that the professors at Harvard and Stanford are not necessarily the best teachers. In my field of biochemistry, for example, we have direct evidence that professors at MIT do a horrible job of teaching biochemistry [Where Are the Best University Teachers?]. In my experience, the best biochemistry teachers are often located at small colleges where they pay attention to the latest pedagogical literature and actually read the textbooks they use in class. has died [Frederick Sanger: Double Nobel Prize winner dies at 95]. Sanger is one of the few people to win two Nobel Prizes. His first was for sequencing insulin and his second was for developing a technique for sequencing DNA (Sanger sequencing). Most people, even most scientists, have no idea how much he influenced molecular biology. Sanger worked at Cambridge (UK). When Francis Crick first arrived at Cambridge in 1947 he soon met a number of important scientists. Here's how Horace Freeland Judson describes Sanger in The Eight Day of Creation (pp. 88-89). One of these in particular, the biochemist Frederick Sanger, came to have great intellectual importance in Crick's thinking and then to molecular biologists generally as the field developed. Sanger is temperamentally and in scientific style Crick's opposite. Where many scientists, Crick among them, flower at conferences and do a great deal of their science by talking, Singer is a quiet man—reticent, even shy, a man who worked with his hands, at the bench. He almost never talked to the press, never despite the editor's importuning wrote the big article for Scientific American. One might spot him bicycling to work on a spring morning, in a drab brown coat, in the rain. Once I stopped to talk with him in the corridor of the laboratory building, where he was waiting in the queue for his turn at the ultraviolet-light box, in order to illuminate the spots on a sheet of chromatography paper he was holding. Sanger is a Quaker by upbringing, and stayed at Cambridge through the second world war; holding only a junior fellowship in the biochemistry department, and even when the war dried up the usual sources of research funds, with family money he was able to keep going. In the course of nearly a decade, beginning in the mid-forties, Sanger settled upon the new techniques of chromatography to determine the amino-acid sequences of the two chains of the bovine insulin molecule. He proved that the sequences are unique and always the same, meaning that every molecule of insulin in every cow is exactly like every other. Yet the sequences show no general periodicities: they are not predictable from ordinary chemical rules. Sanger published very rarely. His papers came to be red with heart in mouth by other scientists, for they are technically brilliant. Even as he worked, though, the news slowly spread and the implications sank in. For one thing, his department held a biochemistry tea club where perhaps once a month research that was relatively finished, though not yet submitted for publication, was presented. Brigitte Askonas, later an important figure in immunology in England, came to Sanger's lab as a doctoral student late in 1948, staying on into 1952. "Even then, Fred had only a minor fellowship—and some had wanted to kick him out," she told me once. "When one would ask him how his work was going, he would say very little. 'Oh, I've got another peptide.'" Then at a lab meeting he would bring a stack of cards showing overlapping short sequences, and slowly, diffidently, build up his latest segment of the molecule. "Crick always came to the tea club," Askonas said. "And he always asked awkward questions. Enfant terrible questions. And then he would explain, somewhat disingenuously, 'You see, I'm just learning.'" Sanger's general conclusion was forceful by 1949, when he went to the annual symposium on quantitative biology at Cold Spring Harbor (his only such visit). In a paper published on the first of June of that year—the earliest of his magisterial series of papers on insulin appearing every odd-numbered year until 1955—he was already able to say that "there appears to be no principle that defines the nature of the [amino-acid] residue" occupying any particular position in a protein. The conclusion was definitive by 1951. For this work and the methods of sequencing he invented to do it, Sanger was awarded the Nobel Prize in chemistry in 1958. (He later turned to the more difficult problem of sequencing nucleic acids, which earned him a share of another Nobel Prize, in 1980. Crick, from his first arrival in Cambridge, new of Sanger's work step by step, months and even years before new steps were published. The Green Party of Canada is led by Elizabeth May who has a seat in parliament. The Green Party (of Canada) advocates many positions that are anti-science [Do Not Vote for the Anti-Science Green Party]. The National Post is a major Canadian newspaper that leans to the right so it has never been a friend on the Green Party. In spite of this bias, they got something right when they wrote, Elizabeth May’s Party of Science seems to support a lot of unscientific public policies. The article was written by Tristin Hopper. Here's what he says in the opening paragraphs. Two months ago in Halifax, Green Party leader Elizabeth May appeared at a Stand Up For Science rally; one of many demonstrations held across the country to protest, among other things, a Canada-wide “muzzling” of government scientists. “You may not like the opinions you get from science, but you have to listen to science,” Ms. May told Halifax radio. Only a week before, however, Ms. May had been at a town hall meeting in her Saanich, B.C. riding telling her constituents not to trust federal science — albeit from a different agency than the ones being defended on the streets of Halifax. 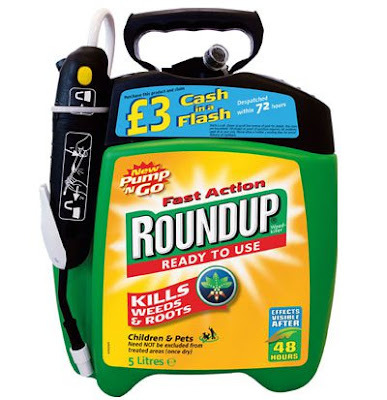 “Agriculture Canada is increasingly a corporate model for profits, for Monsanto and Cargill, and certainly not to help farmers and certainly not to ensure safe food for Canadians,” said Ms. May. The point needs emphasis. There's really no serious scientific debate over the safety of GM food. It is safe to eat. That does not mean that every single scientific paper that has ever been published proves that GM food is safe. You can always find some paper somewhere that backs up your preferred view of a scientific issue. Most Sandwalk readers know that real science is determined by the consensus views of the experts in the field and not by the rogue scientists who disagree. If you've been reading my blog, you will also know that in any debate that involves science both sides have to appear to have science on their side because, if you don't have science on your side in the 21st century, you've lost the debate. Michael has it right. The Green Party is doing exactly what a long list of groups do when their favorite beliefs aren't supported by the scientific consensus. They cherry-pick. Then they make up conspiracy theories to explain why climatologists, evolutionary biologists, nutritional scientists etc. are misleading the general public about the real science in their field. “Just to be clear, there has never been a single reputable, peer-reviewed study that has found any link between the consumption of genetically modified foods and adverse health effects,” he wrote. That's why the Green Party is anti-science. There are many other examples of Green Party policies that are anti-science. You should not vote for the Green Party if you value science. 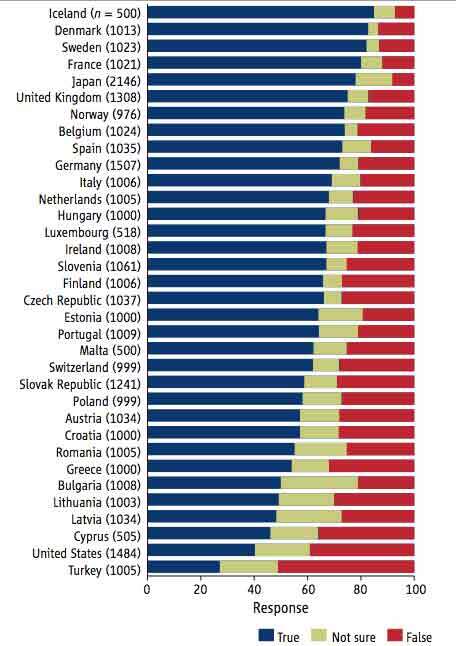 I hate to think what might happen to science if it ever became the governing party of Canada. I tell my students that it's important to understand what your opponents are arguing—you must try and walk in their shoes, so to speak. This is crucial. You may decide that their arguments are completely wrong and ridiculous but you must make sure you interpret them correctly or you are guilty of several sins. You might recall that I recently posted a comment about David Evans, Executive Director of the National Science Teachers Association (NSTA) [David Evans Says, "Teach What the Vast Majority of Scientists Affirm as Settled Science"]. I liked the idea that we should teach what the "vast majority of scientists affirm as settled science." When it comes to teaching, you have to make a decision about what is good science and what is bad science and it seems reasonable to NSTA (and to me) that the consensus among the experts is a good criterion to use. If you read the comments in that post you'll see that it's not always easy to decided what that consensus is, but that's not the main point. Last week's molecule was a Holliday junction, one of the key intermediates in recombination. 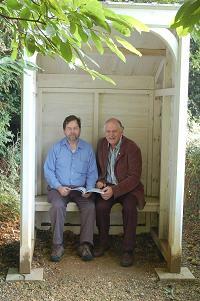 It's named after Robin Holliday who has since retired from science to concentrate on being a sculptor. He has produced several "biological" sculptures including "DNA Structure" (top) and "Cross Over" (bottom). The winner is Caroline Josefsson from British Columbia. The undergraduate winner is Andrew Wallace but since he lives in Australia, I suspect he won't be coming to lunch [Monday's Molecule #222]. Today's molecule (below) is not one of my favorite molecules for many reasons. However, it's pretty important in some species. Name the molecule, being as specific as you can without resorting to IUPAC rules. I need the most common name as well as a more detailed name. Email your answer to me at: Monday's Molecule #223. I'll hold off posting your answers for at least 24 hours. The first one with the correct answer wins. I will only post the names of people with mostly correct answers to avoid embarrassment. The winner will be treated to a free lunch. Toronto Mayor Rob Ford Likes Tim Hortons Coffee! The mayor of Toronto is an alcoholic, a drug user (cocaine), and many other things that make him unsuitable to hold any political office. The city of Toronto is trying really hard to get him to resign or take a leave of absence but there's not much they can do if he refuses to act in an honorable and responsible manner. It's really hard to find anything likeable about the man but I did notice that he likes Tim Hortons coffee. Look at what's in his hand as he walks down Danforth Street in drunken stupor! He can't be all bad, can he? Baldness Is not a Disease. It Does not Need to Be "Cured"
We may be a hair's breadth away from a cure for baldness. Baldness is not a disease so it doesn't need to be cured.1 Gray hair is also not a disease and neither are the wrinkles that appear on your face as you get older. You may choose to disguise baldness with hair transplants or paint your white hairs to make it look like you don't have them. You can even inject botox to hide wrinkles. If you do this, the only disease you have is vanity. And stupidity, for letting the cosmetic industry trick you into feeling guilty about a perfectly natural phenomenon. I'm never going to let my tax money pay for your vanity "cure." Don't even ask if it should be covered by our public health insurance. 1. Don't quibble. 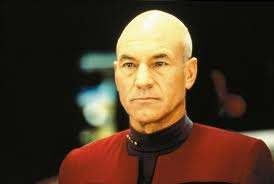 You know that what I'm talking about is the normal kind of baldness in men that develops as you get older. The National Science Teachers Association (NSTA) is responsible for The Adaptation Assessment Probe that I criticized last week. It's a remarkably poor question on adaptation—expecially considering that it was designed by teachers. David Evans1 is the Executive Director of NSTA and he has written about the recent attempts to insert creationism into textbooks in Texas [In Texas, Standing Up for Science]. He says one very good thing in these two paragraphs. 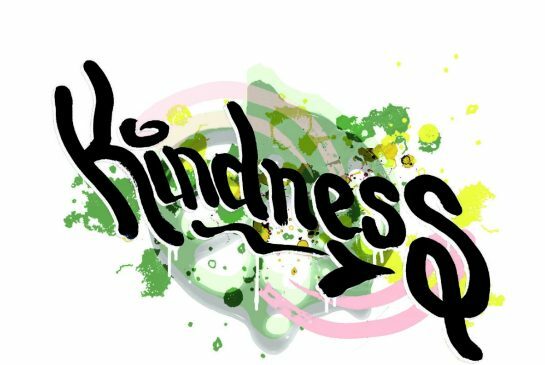 There are many ways that humans come to know, experience, understand and appreciate the world in which we live. Consider, for example, the different realms of religion, science and art. We can all appreciate the beauty of a sunset without understanding that its beauty comes from the energy of a thermonuclear reaction and the refraction of its light in the atmosphere. Likewise, understanding the scientific processes of the sunset does not prevent one from capturing its beauty on canvas or making a spiritual connection. There are countless differing opinions about how best to educate our children, but presenting non-scientific or religious ideas in science class or in science textbooks is simply wrong and blurs the line about what is and what is not science. This will only confuse and mislead students and does nothing to improve the quality of science education and everything to weaken it. Decisions about what counts as science should not be a popularity contest. No matter how many people object, public schools must teach what the vast majority of scientists affirm as settled science. I like the way he expresses the idea that we "must teach what the vast majority of scientists affirm as settled science." This avoids getting into definitions about what counts as science. It avoids the "methodological naturalism" trap. Well done! The next paragraph isn't quite as good. It could have been a lot better. All he had to do was leave out the little phrase that I underline and enclose in brackets. It would not change the meaning but it would properly reflect "what the vast majority of scientists accept as settled science." Texas students deserve the best science education possible, as do students everywhere. This means teaching them sound science, including evolution [by natural selection] as a major unifying concept in science. It is firmly established as one of the most important and robust principles in science, and is the best and most complete scientific explanation we have for how life on Earth has changed and continues to change. Furthermore, the very foundation of science is grounded in, and based upon, evidence. Classrooms will use the textbooks Texas adopts for years (the last science textbook adoption was a decade ago). Compromising the integrity of science for a whole generation of students to satisfy a few vocal ideologues is simply not acceptable. 1. From the website: "Evans holds a Ph.D. in oceanography from the University of Rhode Island and a bachelor’s degree in mathematics from the University of Pennsylvania. He studied for his teaching certification at Villanova University." Last week's molecule was D-serine. (Not L-serine.) The winner is undergraduate Zhimeng Yu [Monday's Molecule #221]. I was reminded of this week's molecule by a discussion we are having in an evolution forum and by a comment from a student who took a MOOC on genetics. Does it depict something that should be taught in every introductory genetics course? Is it something that should be discussed in an evolution course? You need to name the structure formed by the blue, gray, and black strands. It has a specific name. Email your answer to me at: Monday's Molecule #222. I'll hold off posting your answers for at least 24 hours. The first one with the correct answer wins. I will only post the names of people with mostly correct answers to avoid embarrassment. The winner will be treated to a free lunch. This is a video that's specifically designed to teach the mechanisms (plural) of evolution. It's produced by Philipp Dettmer who, as near as I can tell, is an expert on video presentations but not on evolution. A perfect example of style trumping substance. They're Firing Cannons Across the Street! Today is November 11th and the cannons started blasting at 11am in Queen's Park just across the street from the building where my office is located. 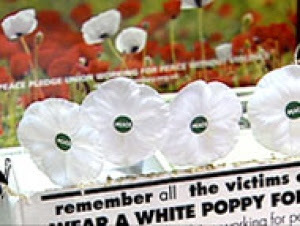 It's a day when we should remember the horrors of war and the waste of lives, both civilian and military. It's a day when we should resolve never to let army generals run the world. It's a day to reflect on the many times that we failed to keep the peace and the terrible cost of those mistakes. So how do we celebrate peace and remember the evils of armies, guns, and bombs? In Toronto we do it by a public display of soldiers dressed in their finest uniforms bedecked with medals. And the army brings its cannons. It's all very glorious. I long for the day when we don't even have an army and all the cannons are rusting in some junk heap. That will be the day when we have truly learned about the evils of war and the purpose of November 11th. I agree with PZ Myers when he asks Who deserves honor? I'm been filing and organizing my mother's genealogical data and I came across a list of people buried in various Prince Edward Island (Canada) cemeteries. 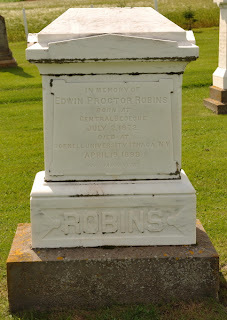 One of the tombstones in the Lower Bedeque United Church Cemetery says, "In Memory Of / Edwin Proctor Robins, / Born At / Central Bedeque / July 2, 1872. / Died at / Cornell University, Ithaca, N. Y. / April 19 1899. / Mors Janua Vitae [Death is the gate of [everlasting] life]" [Edwin Proctor Robins]. This was intriguing. I know I am related to all the Robins (Robbins) descendents from Prince Edward Island but I'd never heard of Edwin Proctor Robins. His great-grandfather, Robert Robbins, is a United Empire Loyalist who came to PEI from New Jersey when the American Revolution ended. Edwin Proctor Robins and I are fourth cousins, three times removed. Why did he die at Cornell University? 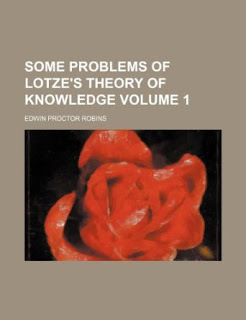 I still don't know how he died and why he was so young (26 years old) but I did find a book he published on Some Problems of Lotze's Theory of Knowledge. I think the book was first published in 1900—a year after he died. Sounds like Edwin Proctor Robins might have been an epistemologist. Does anyone know anything about my relative or about Lotz's Theory of Knowledge? I'm taking a MOOC! It's called Evolution: A Course for Educators. The principle instructors are Joel Cracraft and David Randle of the American Museum of Natural History in New York (USA). Welcome to Evolution: A Course for Educators! We’re excited to have almost 13,000 students enrolled in the course and look forward to spending the next four weeks together as we learn about the Tree of Life, natural selection, the history of life, and human evolution, as well as how to incorporate an exploration of these issues into your classrooms. You can earn a "Verified Certificate" by paying $29.00. This week's issue of Science contains three separate papers analyzing transcription factor binding sites and chromatin modification sites in the genomes of different individuals. If most of these sites are spurious sites that just happen to contain a consensus sequence, then you would expect a lot of variability since the sites are mostly in junk DNA where the sequences make no difference. That's what all three papers found but, of course, they interpret this to mean that the regulatory sites must be responsible for the variation between individuals. These authors are affiliated with several departments at the University of North Carolina in Chapel Hill but, most significantly, they are part of the Carolina Center for Genome Sciences. This strongly suggests that they know something about genomes. I am not a humanist and I'm not a vegan. Sarah Moglia explains why I don't subscribe to either of those two beliefs. I first saw this on Skepchick: Why Vegan Values are Humanist Values. Alfred Russel Wallace died1 on this day in 1913. That's exactly one hundred years ago. Jerry Coyne has posted a guest article by Andrew Berry that should be required reading for everyone who admires Wallace but wonders why he didn't get much credit for natural selection [A guest post for Wallace Day]. The IDiots over on Evolution News & Views (sic) have, of course, an entirely different version of the truth [Counter the History Deniers: Get Out the Word on Alfred Russel Wallace; We've Got the Resources You Need]. Here's what David Klinghoffer has to say about historical truth. 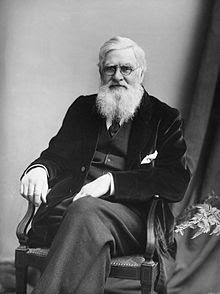 Today is the 100th anniversary of the death of Alfred Russel Wallace (1823-1913), co-discoverer with Charles Darwin of the theory of evolution by natural selection. If you follow us at all at ENV you'll already know that the scientific and scholarly communities have done a terrible disservice to Wallace's legacy by airbrushing out the fact that he broke with Darwin over what University of Alabama science historian Michael Flannery calls "intelligent evolution." That is, Wallace's steadily more certain and detailed view that an "overruling intelligence" guided the evolutionary process. He anticipated major elements of the modern theory of intelligent design. Oh, the irony! It burns! It burns! Well, the massive effort by scientists, journalists, bloggers and others to defend Darwinian theory often proceeds by such airbrushing. You can fight back and counter the censors by passing along the historical truth to friends, students, and teachers, online and in person. It's time everyone agreed to be honest about Wallace -- about the important historical truth that one of the two men to first spell out the modern theory of evolution came to reject that theory as an adequate explanation of life's development, in favor of proto-intelligent design. Toward that end, please join us in refuting the history deniers. You just can't make this stuff up. Every time you think that the IDiots can't get any worse, along comes one of them to show you that you were being far too optimistic. 1. I refuse to use the stupid phrase "passed away." I'm taking a MOOC on evolution that's designed for educators [Evolution: A Course for Educators]. One of the things that was covered in the first lecture was a test on "adpatation" taken from a book called "Uncovering Student Ideas in Science, Volume 4: 25 New Formative Assessment Probes. The book is published by the National Science Teachers Association (NSTA). 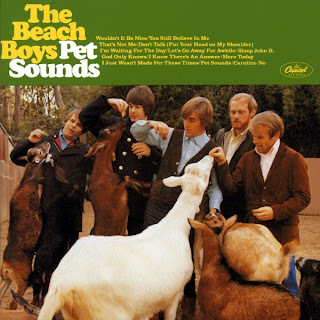 Bernie: "I think all of the rabbits will try to adapt to the change." Leo: "I think most of the rabbits will try to adapt to the change." Phoebe: "I think few or none of the rabbits will try to adapt to the change." Which person do you most agree with and why? Explain your ideas about adaptation. I agree with Bernie. I think all the rabbits will try to adapt to the colder weather by finding warmer, more cozy, burrows and by cutting down on their activity during the cold nights. I think they will adapt by eating more. If hair growth is related to temperature, as it is in some mammals, then the rabbits will adapt by growing thicker coats. The best answer is Phoebe's: "I think few or none of the rabbits will try to adapt to the change." The key word here is try. Biological adaptation involves genetic variation that allows some individuals to survive a particular change, such as a change in the environment, better than others. I didn't read the question carefully. I didn't notice that what they were asking about was not just "adaptation" but "adaptation by natural selection." Silly me. We turned our clocks back one hour last weekend and I'm still adapting adjusting to the change. If this is the kind of nonsense that the National Science Teachers Association thinks is important then it's no wonder that evolution education is in trouble. I once posted a series of articles on Roundup® (glyphosate) explaining how it works and how one makes Roundup®-Ready genetically modified plants. Axel Visel is a member of the ENCODE Consortium. He is a Staff Scientist at the Lawrence Berkeley National Laboratory in Berkeley, California (USA). Axel Visel is responsible, in part, for the publicity fiasco of September 2012 where the entire ENCODE Consortium gave the impression that most of our genome is functional. He is also the senior author on a paper I blogged about last week—the one where some journalists made a big deal about junk DNA when there was nothing in the paper about junk DNA [How to Turn a Simple Paper into a Scientific Breakthrough: Mention Junk DNA]. Dan Graur contacted him by email to see if he had any comment about this misrepresentation of his published work and he defended the journalist. Here's the email response from Axel Visel to Dan Gaur. The latest issue of Carnival of Evolution is hosted by PZ Myers, a developmental biologist with an interest in evolution (among other things). He's a professor at the University of Minnesota in Morris. PZ blogs at Pharyngula. Perhaps you've heard of it? Read: The Carnival of Evolution #65: Horror Host Edition. I prepared for the Carnival of Evolution late at night over the last several days, bracketing the Halloween holiday, and coupled them with my traditional custom of watching horror movies. It wasn’t a good match. The evolutionary stories were far more frightening! There are several dozen contributions and some of them are very scary. How Many Different Cell Types in an Adult Human? We're having a little discussion about complexity in the comments from my post of last Friday [Vertebrate Complexity Is Explained by the Evolution of Long-Range Interactions that Regulate Transcription?]. I pointed out that many scientists just can't come to grips with the idea that humans aren't much more complicated than other animals. We are not special. I call this The Deflated Ego Problem. One of the minor arguments in favor of human exceptionalism is the idea that we (mammals?) have more cell types that other species. Therefore, we are more complex. The number that's often bandied about is 210 cell types. PZ Myers debunks this myth (once again) in Methinks it is like a fox terrier". I love it when people like PZ make oblique references to Stephen Jay Gould as he does in the title. If you don't know what this has to do with fox terriers then you're in for a double treat. Vertebrate Complexity Is Explained by the Evolution of Long-Range Interactions that Regulate Transcription? The Deflated Ego Problem is a very serious problem in molecular biology. It refers to the fact that many molecular biologists were puzzled and upset to learn that humans have about the same number of genes as all other multicellular eukaryotes. The "problem" is often introduced by stating that the experts working on the human genome project expected at least 100,000 genes but were "shocked' when the first draft of the human genome showed only 30,000 genes (now down to about 25,000). This story is a myth as I document in: Facts and Myths Concerning the Historical Estimates of the Number of Genes in the Human Genome. Truth is, most knowledgeable experts expected that humans would have about the same number of genes as other animals. They realized that the differences between fruit flies and humans, for example, didn't depend on a host of new human genes but on the timing and expression of a mostly common set of genes.